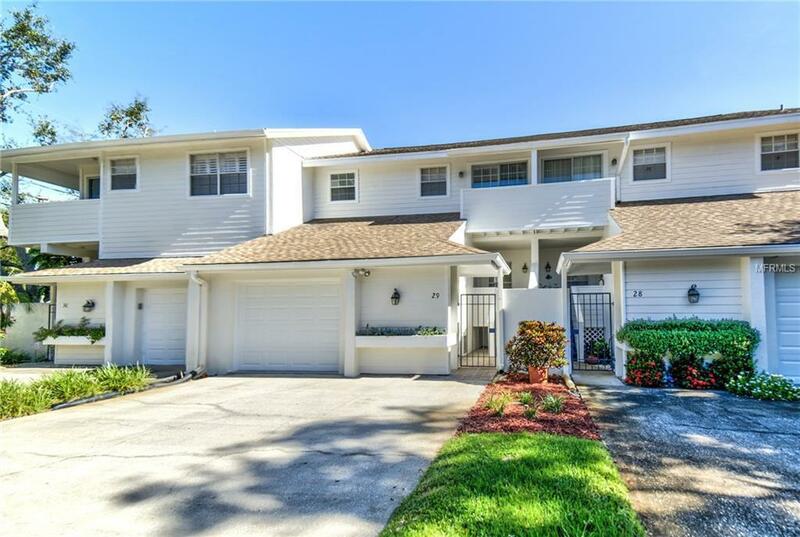 CHARMING South Tampa Townhome near Bayshore Blvd! This truly is a rare find in a perfect location. NEW carpet, NEW paint, NEW fixtures and offers a BONUS ROOM that can be used as an office or den. The first floor has your bonus room just off the garage and across from your kitchen overlooking the dining/living room combo. Living room offers high cathedral ceilings and a wood burning fireplace for those seldom chilly winter Florida nights. A nice sized balcony sitting off the living area has great potential for cook outs or sipping on some fine wine over some good conversation! Upstairs you will find your spare bedroom with bathroom included. Utility room is also located upstairs near your bedrooms and into your double door master suite! Large master suite has a double vanity with LED recessed lighting, California closets and updated bathroom. Also includes a private balcony as well.. for reading or relaxing. Community was recently painted on the exterior in 2016 and new roof in 2012!! Located near Bayshore Blvd, MacDill AFB, Ballast Point pier, schools, shopping, downtown Tampa and so much more! Don't wait.. schedule your showing today before this beauty is Gone!